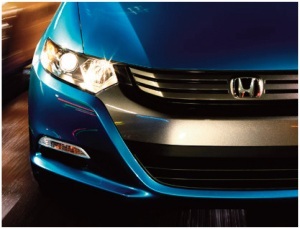 When you want professional, quality collision repair, consider a ProFirst shop, recognized by Canadian Honda Inc. for their commitment to a higher level of customer satisfaction through training and technology. 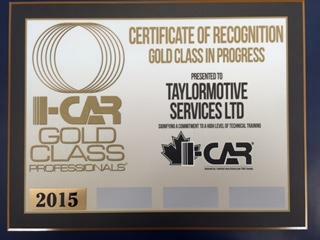 Taylormotive is proud to be an I-CAR Gold Class collision repair shop. Our automotive professionals are trained in the highest standards of collision repair. Does training really matter if my shop is experienced? Yes. Cars have become increasingly complex and technology in different makes and models changes faster than ever before. Procedures can even change significantly from one model year to the next. Current training is essential for proper, safe repairs. How do I find a shop that has earned the Gold Class designation? It’s as easy as using the Gold Class shop finder on this website. Although some collision repair shops advertise their Gold Class designation in ads, on their websites, in their windows or on a plaque in the shop’s lobby, this website is the most current and up-to-date resource to find one. What if there’s not a Gold Class shop near me? There are currently more than 4,000 Gold Class shops in North America. After a collision, restoring the structural integrity of your car is critical to your safety and the lives of your passengers. It’s not minor vehicle servicing — it’s the equivalent of life-saving surgery to your car. Just like you’d travel for a good heart surgeon, it’s worth it to seek out a Gold Class shop for significant collision repairs. What’s the difference between a Gold Class rating and other certifications? The Gold Class designation is the industry standard for training that contributes to complete, safe and quality repairs. While other organizations offer certifications and testing, they do not require ongoing annual training, or test on content that is as frequently updated to reflect today’s makes, models, and technologies. Ongoing training and testing keep repair technicians up-to-date on the latest vehicle models, technologies and repair methods. Gold Class is not a certification that lasts a certain number of years. It’s a designation indicating that a shop undergoes ongoing, up-to-date training every year. Shops that lapse in their training, even for a year, lose their Gold Class designation. Is training all that matters for safety? No. Training is just one of several main contributors to safe repairs. Also necessary are the proper infrastructure, access to vehicle maker repair procedures, and the right tools and equipment. Gold Class businesses have up-to-date knowledge on the infrastructure, tools, and equipment needed to perform complete, safe and quality repairs. But equipment and infrastructure verification is not currently a requirement for the Gold Class designation. Do Gold Class shops provide a better experience for customers? 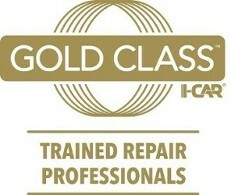 When you choose a Gold Class shop, you’re choosing trained repair professionals. That can contribute to a positive repair experience, as well as contributing to a safe repair. A May 2013 analysis of more than 18,000 collision repair shops across North America by automotive information provider CynCast also found that Gold Class businesses outperformed other body shops by 47% in CynCast’s Shop Performance Value Rating. The rating measures shop performance using important metrics such as how soon on average customers get their cars back, the accurate of the initial estimate, and customer satisfaction. 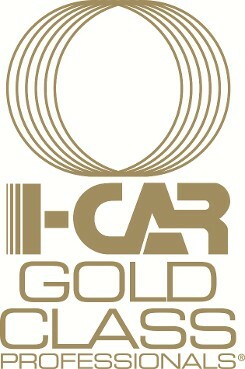 When you see the Gold Class logo, you know a shop is trained in how to make the proper repairs that can retain the safety and structural integrity of your vehicle. Research confirms that choosing a Gold Class business can also mean a better repair experience for you. A May 2013 analysis of more than 18,000 collision repair shops by automotive information provider CynCast found that Gold Class-rated businesses outperformed other body shops by 47% in CynCast’s Shop Performance Value Rating. The rating measures shop performance using important metrics such as how long it takes for customers to get their cars back, the accuracy of the initial estimate, and customer satisfaction. Many insurers, vehicle makers and repair networks require or recommend training for repair shops in their networks, including Gold Class status. Ask your insurance company or car dealer what training their program requires. 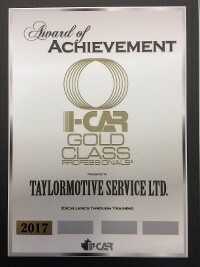 When you need collision repair, consider Taylormotive your collision repair facility of choice, recognized by Certified Collision Care, Canadian Collision Industry Accreditation Program, ARA Certified Collision Repair + Aluminium. With a commitment to a higher level of customer satisfaction. We are also an ICBC collision auto repair Valet shop, making it easier for with your auto insurance claim.